Intellectual property litigation is receiving a lot of attention these days. Headlines suggesting billion-dollar damage awards have grabbed the attention of patent owners and potential defendants alike. With so much at stake, the impact of IP valuation and its application by the courts is enormous. With this new 3rd Edition you can ensure that you have the most current analysis on how courts across the U.S. view key business valuation issues. This just-released compendium includes in-depth analysis on nearly 200 court cases, insight and advice from top business valuation experts, and a list of the top 20 questions to ask when completing due diligence for an IP valuation. Intellectual Property Valuation Case Law 3rd Edition is a must-have desk reference! With the newly released 3rd Edition of Intellectual Property Valuation Case Law Compendium, you’ll find over 200 IP court case abstracts along with full text opinions of cases focused on disputes over the value of intellectual property, and how that amount is calculated. The Compendium includes court case digests written by a team of internationally recognized legal editors. Plus you’ll have online access to the full text of the actual court opinions. 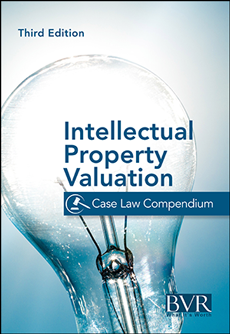 The Intellectual Property Valuation Case Law Compendium also includes a summary table so you can quickly and easily reference cases by name, type of case, date, court, and state/jurisdiction. Technology Transfer Tacticsis proud to partner with Business Valuation Resources (BVR) in bringing this important reference to our customers. Every top business valuation firm depends on BVR for authoritative market data, continuing professional education, and expert opinion. The Intellectual Property Valuation Case Law Compendium 3rd Edition is available via print and/or PDF, or you can purchase both print and PDF for the value price of $299.00. And don’t forget, your satisfaction is completely risk-free with our NO QUESTIONS ASKED MONEY BACK GUARANTEE.